Pound gained momentum by news of the possibility of Theresa May being the next prime minister although GBPUSD is still effected by the Brexit issue. GBPUSD is fluctuating above the weekly pivot point and is trying to rise back to its previous status before the Brexit. 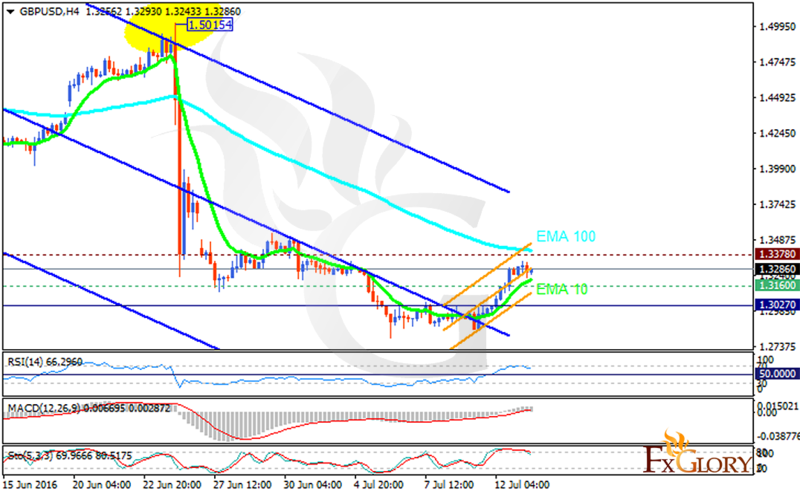 The support rests at 1.31600 with resistance at 1.33780 which both lines are above the weekly pivot point at 1.30270. The EMA of 10 is growing to reach the EMA of 100. The RSI is moving in the overbought area, the MACD indicator is in positive territory but the Stochastic is showing downward momentum. The pair will go to higher ranges however there will be strong resistance around the 1.3500 area to limit the pair’s upward momentum.